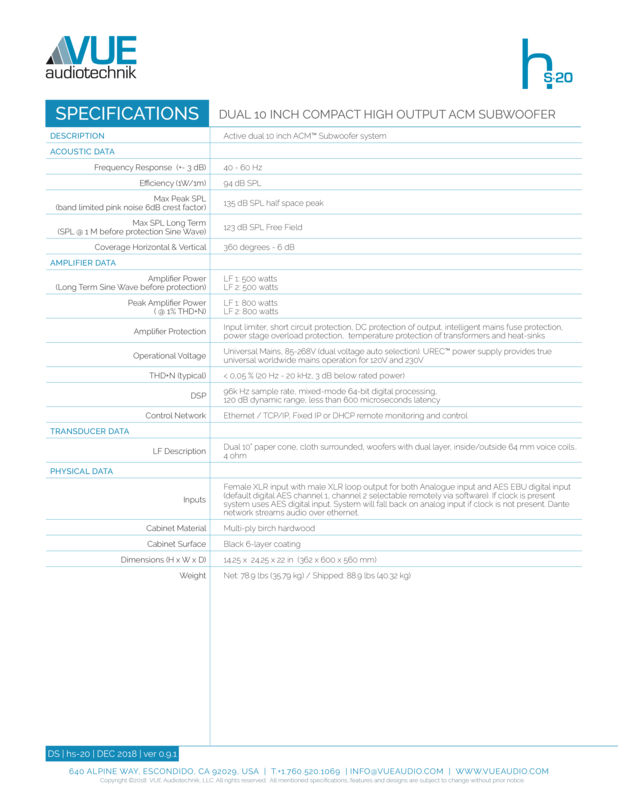 The hs-20 utilizes VUE’s revolutionary, Active Compliance Management (ACM) technology to reset the size-to-performance benchmark for ultra-compact subwoofer systems. The combination of ACM and the hs-20’s highly-sophisticated onboard electronics result in massive amounts of pure, clean low-end energy from a dual 10-inch configuration that’s no larger than most single 10-inch designs. VUE’s patent-pending ACM technology combines both band-pass and vented alignments into a single enclosure. The hs-20 places two high performance, 10-inch transducers into a common vented chamber. One woofer’s frontal radiation is direct, while the second woofer’s frontal radiation drives the band-pass chamber. To make the two ACM subsections combine acoustically, we use sophisticated DSP to precisely align the phase arrivals of the front facing woofer, the common chamber vent, and output of the bandpass chamber vent. The powerful built-in amplifier sends 500W of pure sine wave power (800W “burst” ) with a unique optimized signal to each woofer. The combination of 3600 watts of burst power produces over 137 dB peak output in a half space environment (ground stacked). The combination of ACM, precision-engineered transducers, and sophisticated electronics allows the hs-20 to deliver much higher output throughout its operating bandwidth from a remarkably small enclosure with a footprint that’s smaller than most dual 10-inch vented designs. Like all h-Class systems, the hs-20’s inputs include analogue XLR, AES/EBU Digital (2 Channels) and Dante network audio streams. You can elect from each input and channel using SystemVUE software and it will auto fall over from digital to analogue for maximum reliability. Like all h-Class systems, the hs-20 ships with networking capabilities already onboard. There’s no need for additional cards or retrofitting. VUE uses standard IP protocols to simplify the networking process. Simply plug in and the hs-20 will automatically connect to virtually any kind of IP configuration. Users can then access and monitor network and device-level parameters through our SystemVUE software. We’ve housed all this rich, subwoofery-goodness in a rugged polyurea/polyurethane hybrid elastomer finish that ensures years of one-the-road service. The h class finish is both environmentally friendly (with zero VOC – Volatile Organic Compounds) emitted during manufacture and chemical and moisture resistant. A highly-durable, 6-step Dura Coat finish looks great and protects the hs-20 through many years on the road. The hs-20 cabinet also comes with a 20 mm threaded insert for a speaker pole on both the top and side of the system. ACM is a unique hybrid design that combines the attributes of direct radiating and band-pass configurations to reduce distortion and optimize amplitude and phase response.